Richi Ferrero was born in Turin on March 25th 1951. 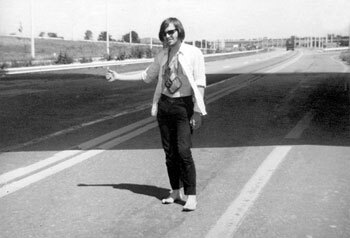 At the age of fifteen, fascinated by the Beat Generation, he began a long hitch-hike around Europe and the Orient. For four years he made a living by playing in the underground stations of big cities; he stopped in Amsterdam, Paris and Istanbul, crossing Turkey, Iran, Afghanistan and arriving in Pakistan. These were years rich in important meetings and experiences that would have a seminal influence on Ferrero’s artistic and creative career that followed his definitive return to Italy. Once he returned to Italy, in 1971 he founded  with Mariano Meli, Gianna Franco and the actors from Michelangelo Pistoletto’s experimental company Zoo  the research theatre company, Granserraglio. In the same year Granserraglio made its debut with its first show, Teatro Scultura, at Giorgio Ciam’s Triade Gallery in Turin. In 1972 Ferrero moved for a year to Morocco with Granserraglio. 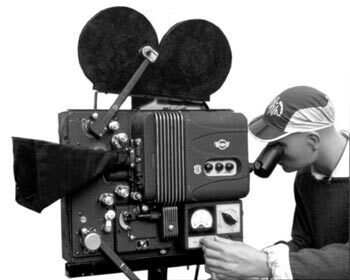 During this long stay the group dedicated itself to studying the local musical culture and the production of a mid-length, slow motion film entitled Destino. The film, directed by Mariano Meli, was never completed, but sees Ferrero as the lead and co-writer with the rest of the company. In the same year, on returning from Morocco, Granserraglio staged Lo Spettacolo in Cascina, with Lucio Cabutti’s “Gruppo dei 5 di Torino”: on this occasion Ferrero was actor, co-author of the scripts and curator of the music. 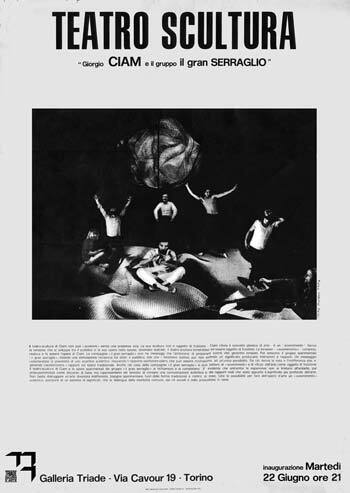 Between 1973 and 1973 Ferrero and Granserraglio staged various shows, directed by Mariano Meli, in particular Lo Spettacolo del giorno dopo, presented at the historical Rassegna Incontro Nuove Tendenze in Salerno in 1973. On the bill are the names of Pier’Alli, Leo De Berardinis, Perla Peragallo, Giuliano Vasilicò and Memè Perlini. Ferrero moved with the entire group to Sicily in 1977, when the island was taking its most important step in theatre decentralization: 114 towns were involved in the performances and 14 theatres, closed in the post-war period, were re-opened for the occasion. They were years of intense work, with arduous schedules, but very important for the theatrical formation of the members of the company, all self-taught. In 1981 Granserraglio made itself felt at a national level with the show Donne: Storia di ordinaria follia in which Ferrero interpreted Charles Bukowski. In two seasons, the show had more than two hundred repeat performances throughout Italy, from Bolzano to Messina. Inappropriately the critics considered the performance the first “red light” theatre play. The following year Ferrero had his second cinema experience as the protagonist of a short-length film Lie Detector, directed by Guido Chiesa. 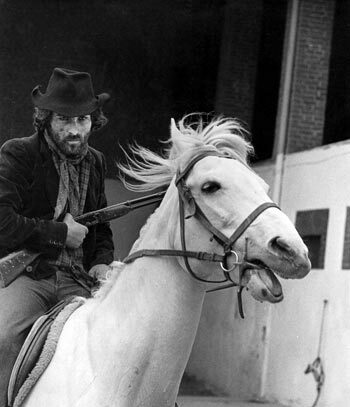 Following the success of the show Donne: Storia di ordinaria follia, the Granserraglio tried out Sonata Colt, the first western in the theatre, inspired by the character of Tex Willer. During the rehearsals, internal reasons transformed Sonata Colt into Uppercut Sonata  Boxe. Storia di un incontro, which marked the debut of Richi Ferrero, director, although he was also the creator of the show and one of the actors. 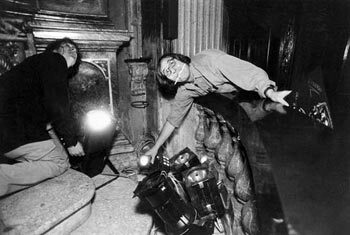 In 1984, on the occasion of the second edition of the Festival Internazionale Cinema Giovani in Turin, Granserraglio staged Set, their first installation of urban theatre. Designed by Ferrero, it represents an important moment in the long process of transition that was to lead him from stage theatre to new forms of expression: urban installation, monumental and artistic illumination and museum design. In 1985 Ferrero founded Il Magnifico Atelier, a gigantic industrial structure where he staged installations of urban theatre, designed and constructed scenery for external realities, such as the Teatro Regio in Turin and the Museo della Scala in Milan. In the same year Giugiaro Design charged Ferrero with designing a spectacular installation for the world launch of the first Giorgetto Giugiaro fashion collection at Palazzo Pitti in Firenze. In Turin, during September, the Granserraglio under the guidance of Ferrero inaugurated a second urban installation: Torino Stupefacente. In 1986 Ferrero and his group designed and staged the installation of 32 tonnellate spinte in cielo... come se fosse il mare. On this occasion Ferrero began his collaboration with the directors Claudio Paletto and Mimmo Calopresti. In the same year he took the lead in two films: Love Song and Sinn Fein directed by Paletto and Calopresti. In 1987 it was the turn of Per ora, per quest’ora, per questa volta ancora... In this urban theatre installation Ferrero theorised the “dramaturgy of fixedness”, the theme and philosophy of all his later productions. In the meantime he analysed the use of light, experimenting with new systems of illumination, collaborating with important private and public institutions, specialising in the illumination of works of art and monuments, as well as theatre. Between 1988 and 1989 Ferrero returned to stage theatre, with particular attention to contemporary drama, principally referred to the German authors, including Fassbinder and Achternbusch. In 1989, with Gianna Franco and Sergio Martin, he purchased the Teatro Juvarra, which became the headquarters of the Granserraglio. In the same year he experimented for the first time, on the occasion of Torino Metaphysica, with laser. 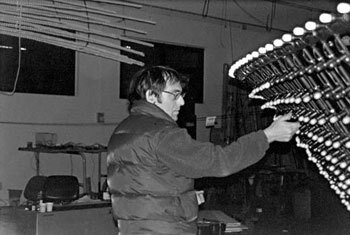 Again in 1989, with Marina Gariboldi he designed and staged Trame d’autore, experimenting with new systems of illumination on the works of the painters Balla and Dorazio. He was retained for three successive seasons by the Comune di Torino to design and direct the city festival, for which he re-proposed, in a modern key, the baroque naumachia, an ancient tradition. On this occasion he studied and experimented with fireworks. 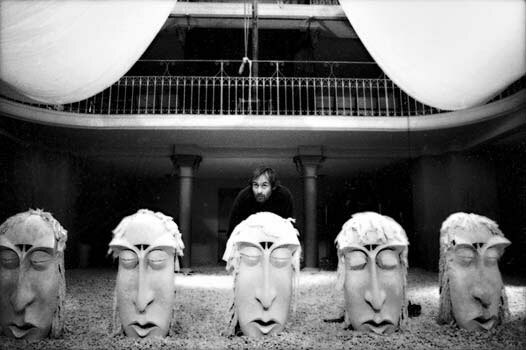 In September 1989, in another Granserraglio production, he presented Assalto al Sole, an urban cinema installation. In October, on the occasion of the Festival Internazionale del Cinema Sportivo, he worked on the cupola of the Mole Antonelliana using a computerised laser system. For the Museo Teatrale at the Scala in Milano, in collaboration with Sebastiano Romano, he worked on the projects for the illumination of I Viaggi di Mozart in Italia (1991) and Lo spazio della musica nelle “Memorie” di Carlo Goldoni (1993). In1992 he had an enjoyable time himself with the Sorelle Suburbe: directing the play Torna a casa Ulisse, in which Bruno Gambarotta played a part. In 1994 and 1995 he was again the director of the plays Le Sorelle Subu­rbe. Il meglio del peggio and Le Sorelle Suburbe straparlano d’amore. In 1993 he created, with Gianna Franco and Sergio Martin (who was responsible for the artistic direction), Café Procope, a multimedia hall beside the Teatro Juvarra. In the same year Granserraglio took part in the fifteenth edition of the festival AstiTeatro with the show Hot-Line by Angelo Longoni, performed by Ida Di Benedetto. Ferrara was responsible for the abridgement and the direction. 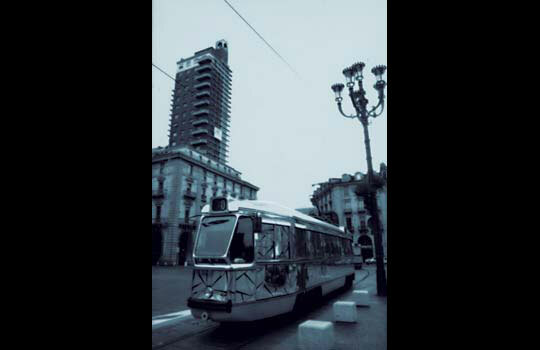 With Desiderio - Tram etnico (1994) a city streetcar was transformed into an itinerant installation. Thus Ferrero showed his vocation for making the city a stage, making theatre of the typical elements of urban life such as the streetcar. The same year he organised for Granserraglio a colossal show in the grounds of the Stupinigi Palazzina di Caccia (hunting lodge): Teatro del fuoco. The event included dance, acting, fireworks and moments of extravaganza, bringing enormous machines onto the scene. 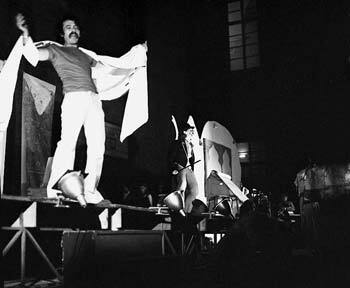 More than one hundred artists  actors and dancers  took part in the show. The staging of Millenium at the Teatro Juvarra (1995) highlighted Ferrero’s increasing desire to leave the confines of the theatre. With tons of gravel he transformed the stalls into a hypothetical anthropological space, confining the public to a platform on the stage. In summer of the same year in Canto per Torino, he was co-author and interpreter of a show directed by Gabriele Vacis, which involved the principal theatrical forces of Turin, an initiative that was intended to be a premise to a new way of making theatre, uniting all the creative forces in a single company. Cinema reappears periodically in Richi Ferrero’s career. They are isolated episodes that go beyond a specific interest for a cinema career, but which emphasise the peculiarity of a total artist who does not neglect any form of art. In 1995 he played the father of Milena Sutter in the television drama Il caso Bozano, directed by Felice Farina. In 1996 he concluded his experience with Granserraglio and founded Gran Teatro Urbano, a reality that better responded to his creative intentions and which made its debut with the show Concert Para Voices Und Colori. It was staged on the occasion of the European Summit in Turin, with its gigantic images that enveloped an entire square, whose buildings were transformed into paintings. Concert was the ideal visiting card for this new reality whose name was its vocation: “urban theatre”. In the same year Ferrero participated with the companions of Canto per Torino in staging the intinerant show Le Lunelanghe which once again involved all the forces of Turin theatre. The event dramatised the entire town of Verduno and its inhabitants and brought about the review, planned by Beppe Rosso, Veglie di mezza estate (Parco Culturale - Grinzane Cavour Festival). In 1997 Ferrero was appointed by the Regione Piemonte and the Museo Nazionale della Montagna to create the permanent lighting of the Fortress of Exilles: it was one of the first applications of theatrical lighting to an architectural structure. In the same year he directed the show Retablo by Vicenzo Consolo, staged with Sebastiano Romano in Milano, in the church of San Paolo Converso. 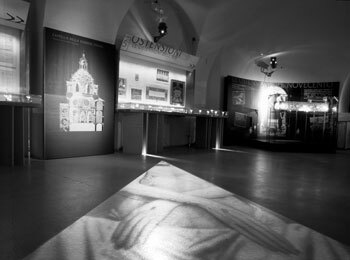 In 1998, with Marina Gariboldi, Ferrero designed the Museo della Sindone (The Museum of the Holy Shroud), inaugurated on the occasion of the Exposition, the first result of an application of theatrical criteria in a totally different field. Charged by the city of Turin with the management of a series of spectacular events, Ferrero began collaborating with Musica 90, an important national reality operating in the sector of “world music”. Together they produced Lucicanti di maggio, a two-fold project that transformed historical churches in Turin into open-air art galleries using gigantic projections. Inside, an innovative programme of music was enriched by the dramatic, progressive lighting of the works of art contained in them. In 1998 Turin began the artistic Christmas lights project “Luci d’Artista” with installations as part of the urban fabric. For the first time Ferrero was called upon to participate in a collective that involved important names in visual art. A gigantic crane transformed into a light sculpture was the dominant element in the three works presented in the three consecutive editions of the project: Porto Palazzo, Imbarco Torino, and Lucedotto. On this occasion the recurrent idea of dramatising the city, and therefore using the typical elements of the urban fabric  such as a crane  transforming them into works of art, was even more evident. The monumental lighting projects continued in the meantime: Ferrero illuminated five churches and the main street of the town of Ciriè, in the province of Turin. In July 2000, after five years work, the Fortress of Exilles was inaugurated: the two museum areas set up by Ferrero showed the public and the critics a new way of creating a museum, at a time when a debate was raging on the subject. 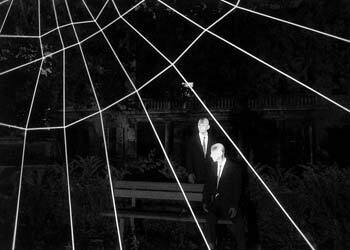 By invitation of the Fondazione Novalia, he presented an installation to be included in the itinerary Le fil(e) d’Arachné (Wood Wide Web) in the woods around Orta San Giulio: for this occasion he made use of the potential of the Wood lights to make a gigantic spider web luminous. For the 2006 Winter Olympics he's called to draw the artistic illumination of the major monuments of the city of Torino, for the same occasion he realizes with Carmelo Giammello a luminous sculpture, "Il Dente del Gigante" ("The Giant's Tooth"). From 2007 he decides to focus on visual arts and realizes various works for private collectors, among them "Il Grande Guerriero" ("The Great Warrior"). In 2009 his work with Wood lights, coming from a 20 years experimental research, is presented in a solo show "Luce Nera" ("Black Light") at the Galliardi Art System Gallery in Torino. Some of the works of the "Luce Nera" solo show belong to private collectors and were presented in international art fairs. On that same occasion he realizes the site-specific installation "Re di Fiori" ("King of Flowers") on the King's monument in Vittorio Emanuele Avenue in Torino. Bwindi Light Masks is a luminous installation first presented at Luminale in Frankfurt in 2010, since then it traveled all the major light festivals.